I live on a small farm and raise a flock of wool sheep for absolutely no reason other than they’re cute. I pretend to be a spinner and make cool things with the wool, but in truth, I never find the time and my spinning wheel sits in the living room gathering dust. My family hassles me about the uselessness of my sheep. But, hey, they’re so cute! 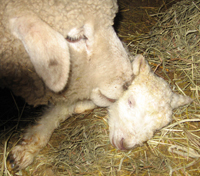 Spring is a fun time when raising sheep because spring is when lambs are born. Quite often I come into the barn in the early morning, early enough that it’s still dark outside, and while fumbling around for the light I hear this special little sound. It’s the sound of a new lamb. Yes, a new lamb meekly baaing is precious. But that’s not what I’m talking about. I’m talking about the sound its mama makes, a sound I don’t quite know how to describe. The ewe gurgles this special “coo” you only get to hear shortly after her lamb is born. To me, its a sound of excited joy, maybe the same type of nurturing noise my husband and I might have made when the doctor first laid our baby on my stomach. And while we humans are never quite sure what to do with our firstborn babies, a ewe is amazingly different. God made animals with instinctive care mechanisms and even a first time ewe, in spite of her amazement at what’s just transpired, acts with an unknown guidance. She starts her cooing and she starts cleaning her lamb. Yes, my sheep are cute. But, they’re also inspiring. When I hear a ewe coo to her lamb—her means of communication—I’m thrilled to think I’m caring for the animal Christ used most to communicate his love for us. My sheep remind me of the loving care Jesus gives me. He is my shepherd. Have a blessed Easter! May you find joy knowing that Jesus, our loving shepherd, has risen!